It's time for the randomly-scheduled feature where YOU are the star, "Treats From the Inbox"
Looking back at about a year of these photos (since the feature unofficially started in January during the Steelers' Super Bowl run), I can say that you never fail to amaze me with the extreme locales, creativity, and sheer quantity of your pics. I mean, there has simply been a ton of submissions throughout 2009. A more passionate fan base I cannot imagine. I thank you for your many contributions. I can definitively say that this has become one of my favorite features to organize on the site - and certainly more enjoyable than a post about the Pirates potentially bringing back Xavier Nady and/or Ron Villone, which was tonight's much, MUCH less desirable Plan B. "My buddy and I went over to Egypt to visit our friend who moved their after college and married an Egyptian girl. 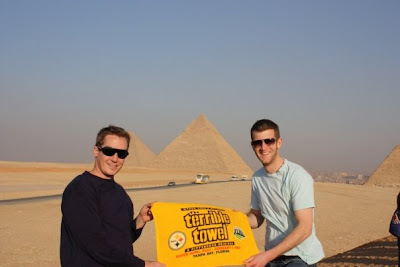 All 3 of us went to high school in the Burgh so of course I brought the old faithful and had to get a pic of the 3 of us in front of one of the seven wonders of the world. 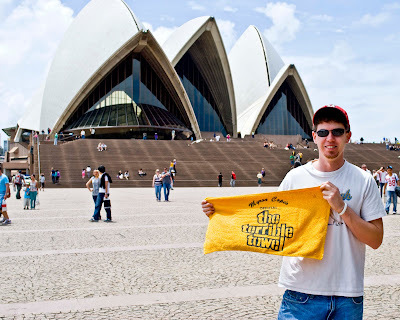 this summer showing some Steelers love. They have this T.I.G.E.R.S. "I went to the Pitt vs. Notre Dame game. It was awesome, absolutely the loudest Pitt game I've ever been too. First of all, I'm sorry about the poor photo quality. I'm a bad photographer and I was using my iPhone which has the worst cell phone camera known to man. Anyway, I found these two pics for you. 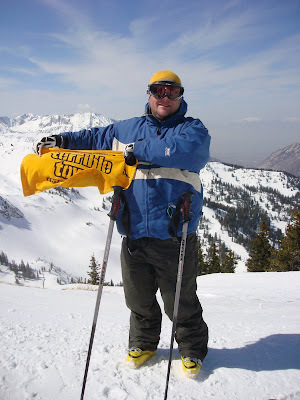 The first one, of the Snuggie, is a piece of "memorabilia" they are actually selling at the Sideline Store outlets in Heinz Field. I would give one of my toes to see the sales figures on that little piece of marketing genius. 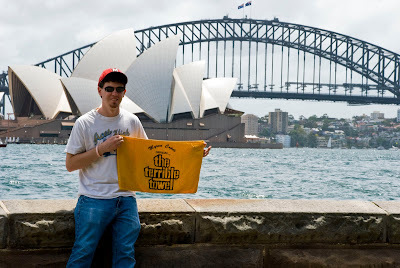 The second one was as we were coming out of Heinz Field and walking to our car. 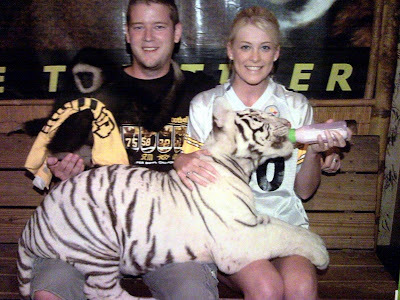 Yes, that's right, not only is it a Steeler Jersey at a Pitt game. Not only is it a Duce Staley Jersey. 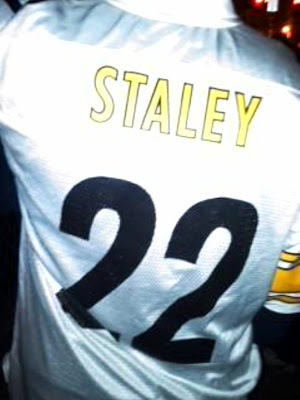 But it's an AWAY Duce Staley Jersey. I saw it and thought of you. As I was snapping the picture the guy turned around and noticed us. My brother (who came to the game with me) chimed in, "Oh sorry man, we just like your jersey is all". The guy responded "Yeah!! Go Pitt!! Duce Duce!! He's the man!! WOOOOOOOOO!!!!" 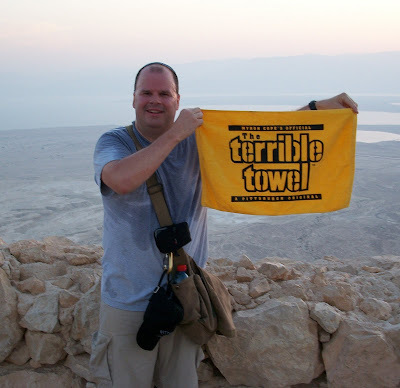 "On a recent trip to Israel here is a picture of the Terrible Towel atop Massada after climbing up. Met at the base at 4:30 AM to climb and see the sunset. The climb wasn't so bad, but the last time I was up at 4:30 I was GOING TO bed (and in no shape to climb!)" -- Scott F.
"Here's a pic of a recent trip to Hawaii where I finished up some surfing with a photo op to represent a bit." 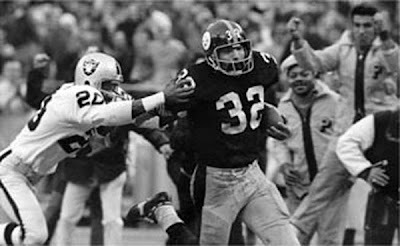 -- Mike E.
"After browsing SI.com's morning jolt, I noticed something in the "must-see photo." Can you recognize the script on the grey sweatshirt in the lower left corner? That's right, that's a PITT showing at a Yankee celebration. Take it in." -- Dan K.
"I didn’t know Kramer worked for the Three Rivers ground crew way back when?" 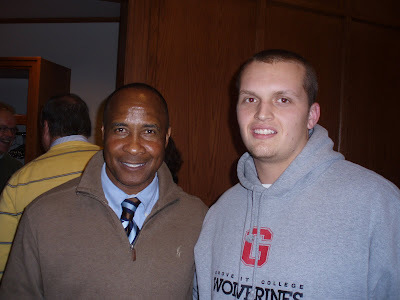 -- John M.
It hurts to post a Grove City picture doesn't it?